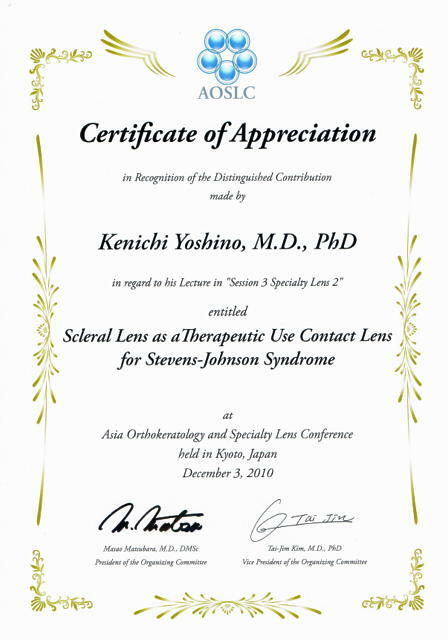 Kenich Yoshino, MD PhD（Guest Speakers）Scleral Lens as a Theapeutic Use Contact Lens for Stevens Johnson Syndrome．The 2nd Asia Orthokeratology Contact Lens Conference (AOCLC) Dec. 3, 2010 in Kyoto, Japan. ©2019 YOSHINO EYE CLINIC. All Rights Reserved.